Himalaya Journey Treks & expedition:: Kalinchok Trekking :: Kalinchok Trek :: Kalinchok Trekking information :: Kalinchok Trekking Itineraries :: Kalinchok Trekking Trail :: Kalinchok Reise, Reise in Kalinchok, Kalinchok Rolwaling Trekking, view from Kalinchok, Nepal Kalinchok Trekking, Kalinchok Treks, Reise Buro in Nepal, Kalinchok panorama Trekking, Kalinchok Trekking and Hiking, Kalinchok Tour, Kalinchok pilgrimage Trekking, Kalinchok and Tashi lapcha pass Trekking, Rolwaling Trekking, Rolwaling Trek information, Trekking in Kalinchok, peak climbing in Kalinchok region, Ramdung peak climbing, Trek to Kalinchok, Nepal peak climbing, Nepal Trekking Guide, Nepal information. From Kathmandu drive via Barabise to Kharidunga. Along the trek you will come across some villages mainly inhabited by Tamangs, Sherpas, and Brahmins. Along the trail also can be seen are a few monasteries and Temples. A good view of the Mountains and Sunkoshi river can also be had. After crossing Sherpa villages you come across a thick forest with lots Rhododendron trees. After that you reach Kalinchowk. From the highest altitude of Kalinchowk (3579meters) you could get a good view of Annapurna, Lamjung, Manaslu, Ganesh Himal, Shisha Panga , Langtang, Dorjee Lakpa, Jugal Himal, Amabamori, Gauri Shanker, and Namburi Himal. There is also a prominent temple of the Hindus called the Kali temple. Two natural springs originate from this area which are called Sundhara and Tama which are the main source of the very big two rivers the Sunkoshi and Tama Koshi rivers. From Kalinchowk one could get a good view of Kathmandu at night. The main flowers of Nepal Rhododendron (Laligurans) and the national bird Pheasant (Danfe) can also be seen in this area. 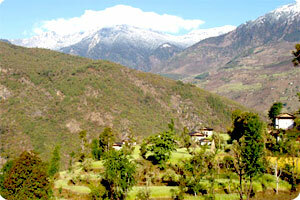 While descending to Suspa you could get to see a very rare community in Nepal called "The Thami." The trek ends at Charikot which is also a district head quarters then drive back to Kathmandu or possible to do the Sailung Trek as same time. Ending at: Charikot to Kathmandu by Bus. Highest access of the trek: Kalinchok Temple. Himalayan sights: Gaurishanker,Everest Himalaya range etc. Day 01: Arrival in kathmandu 1334m, Himalaya Journey Treks & Expedition’s representative will transfer to hotel , Kalinchowk trekking briefing with officially arrangements. overnight at Kathmandu. Day 13: After breakfast, Relaxing/shopping with own activities ,Himalaya Journey Treks & Expedition’s representative will drop to Kathmandu international airport for onward destination.